This recipe Sue always served at card club. This would be good for MAD Week-end, a trip to Grandma’s house or anywhere for that matter. You must try! Combine the last 4 ingredients; bring to a boil for about 2 1/2 minutes, stirring constantly. Remove from stove and add 1/4 tsp. baking soda. Grease jelly roll pan or roaster. 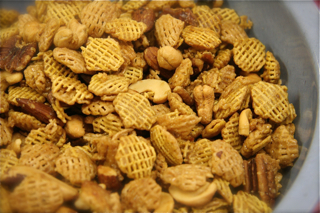 Pour Chex mix and nuts in pan. Pour syrup mixture over mix and bake at 225º for 1 hour, stirring every 15 minutes. Spread mix on wax paper to cool.